Please direct any questions or comments concerning Greene and Cocke County trails to BCHET Facebook page. 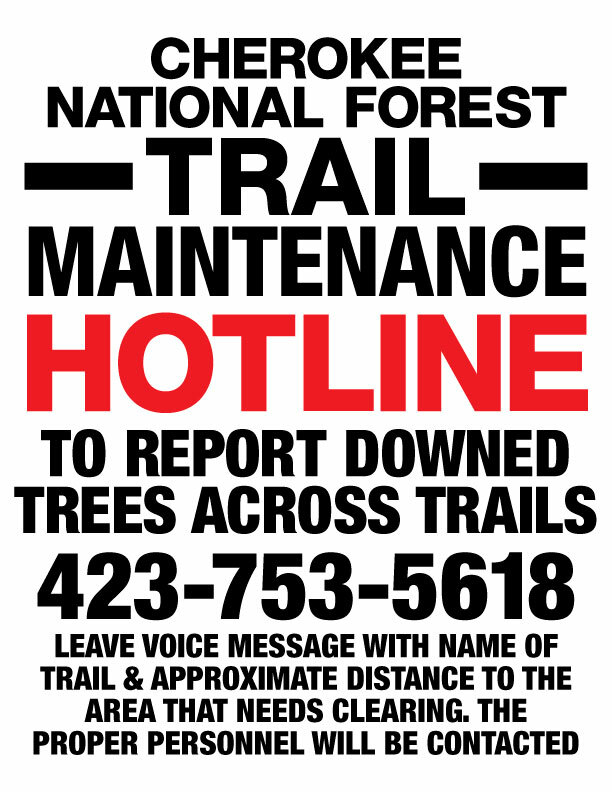 Please report any time that you spend conducting ANY trail maintenance to the to the Trails Hotline number 423-753-5618. It is very important that we record any time which a BCHET member spends preforming trail maintenance, no matter how minor. If you would like to volunteer to scout trails, report blow downs, washouts, and to assist in clearing your favorite trail, contact the Trail Maintenance Hotline at 423-753-5618. Meadow Creek Mountain Trails (Gum Springs Trail, Mill Rock Hollow Trail and Meadow Creek Trail). With Paint Mountain Trails (Chimney Rock Trail, Paint Mountain Trail, Paint Rock Trail, and a parking area at Weavers Bend which all overlook the French Broad River). The Meadow Creek Trail is currently being rerouted on the Long Creek end. A parking lot adequate for three horse trailers was added on Cedar Creek Cave Road. This parking lot provides eastern access to Meadow Creek Mountain Trail. The Meadow Creek Mountain Trail, a 14 mile linear trail along the crest of Meadow Creek Mountain, was impassible for many years due to washouts and blow downs. Over 360 Back Country Horsemen of East Tennessee volunteer hours were spent clearing and rebuilding this trail. Lumber and materials such as 1840 pounds of concrete and twenty five 3 in. by 6 in. by 8 ft timbers were packed by horses or carried to the site in order to restore sections of Meadow Creek Trail on the eastern end, as was the trail by Tweed Springs near the old hotel. The connector, “Mill Creek Hollow Trail”, has been completed to the Meadow Creek Trail to provide access to the “Meadow Creek Mountain Rustic Resort”. At Old Forge the steps were repaired at the trailhead creek crossing. Directions to Trailhead: From Greeneville, Tennessee, drive State Route 70 south for 9 miles. Turn west on State Route 107 south and follow six miles as it winds south through Houston Valley. Cross the Greene/Cocke County line and continue south past Houston Valley Campground to Burnett Gap at top of hill. Turn east into the parking lot. Burnett Gap is well signed. The trail starts at the parking lot and is marked by a carbonite sign. Description: Burnett Gap Trailhead (#510A) has 11 miles of trails. Burnett Gap Trail exits the back of the parking lot through a forestry gate. Ride this forest road approximately one mile and follow yellow blazes until you ascend steep switchbacks and arrive at a meadow. Follow a grassy forest road approximately three miles to a “T” intersection and turn left at the carbonatesign. Descend this forest road approximately two miles and turn left at the “Y”, cross through the creek and bear right. This road will end and become a trail that ascends a ridge. On top of the ridge descend along the roadway to Weavers Bend Road. To make this loop turn left for approximately two miles past Allen Branch Pond (#209) thru the forestry gate on the left and ride until the forest road ends. Turn right up a steep hill to the top of Brush Creek Mountain and follow the yellow blazes back to Burnett Gap Trail and turn right and follow back to the trailers. Volunteers are needed to “virtually” adopt their favorite trail and provide current updates on the trail condition. Directions to Trailhead: From Greeneville, Tennessee, drive State Route 70 south for 9 miles. Turn west on State Route 107 south. At 8.5 miles, turn east on Brushy Creek Road (FDR 209). This is a narrow, winding, one lane paved road that courses along the edge of the spectacular Brushy Creek. Turn east on the first small dirt road over a bridge that presents itself, FDR 209C. Continue on this dirt road 1 mile until a large parking lot for horse trailers will open on the south edge of this roadway just before crossing the railroad tracks at Weaver’s Bend. A carbonite sign on the north edge of this roadway indicates the trailhead to Chimney Rocks. Paint Mountain Trail Loop #1:4 hours. Look for the gate on the left just before the set of railroad tracks. The trail to Chimney Rocks begins on an old road and enters a large field after a short ride up a big hill. Continue straight ahead on the road for a half mile until a small trail sign is reached where an old dead end road comes in from the left. Continue straight on and ride steeply up the crest of a ridge. The riding will become slightly less strenuous as a series of switchbacks is encountered. Ride through pines and hardwoods, wildflowers that may be seen are Spring Beauty,Smooth Yellow Violet and New England Aster. This trail climbs to the ridge top and rises almost continuously in elevation, a change of 1400 feet, in a little over two miles. Here there are panoramic views of the French Broad River Basin. This is the best place to check out the fantastic views of the French Broad River as it meanders through Weaver’s Bend. Although this vista is great any time of year it is especially scenic during the winter months when the foliage is absent from the trees. Follow Chimney Rocks Trail until it intersects with Paint Mountain Trail. Look for old wooden forestry signs. Turn left onto Paint Mountain Trail and follow along the mountain through the woods paying close attention to the yellow marks on the trees winding down to the French Broad River. Turn left on the gravel road and gait about one mile back to the trailers. Paint Rock Trail Loop #2: 6 hours. To make a larger loop ride right at the Paint Rock Trail instead of the tight switchback on the left to Paint Mountain Trail, wind down the narrow, rough, old roadbed to Paint Rock. Ride right as this trail intersects with a very short strip of paved road and ride across the bridge. This is where Paint Creek drains into the French Broad River. Look for Indian hieroglyphs on this cliff face along the river. After enjoying lunch turn around and ride back over the bridge and take the left fork of the road past the trail where you came out onto this road. Ride on and this road will turn to gravel. Ride two hours all the way to the top. The views are spectacular and seen by very few. Ride past the first gate on the left and continue on to the second gate at the top, which is Lone Pine Gap. Turn left at this gate onto the Paint Mountain Trail. Follow this trail back down along the French Broad River and turn left for an easy one mile gait along a shaded dirt road back to the trailers. Directions: Take State Route 70 south from Greeneville to South Greene High School where you make a right onto Cedar Creek Road (Country Road 1342). Travel 3.2 miles, turn left onto another county road. After 0.2 miles take the gravel road on the left which leads to the trailhead parking (1.4 miles). Alternatively from Newport, take US 25/70 for 4 miles, make a left on State Route 340 and after 1 mile turn right onto Long Creek Road (County Road 2576). The trailhead will be on the right in half a mile. 14.8 miles of yellow paint -blazed trail offering many scenic views. Parts of the trail are steep and/or narrow. Primitive campsites can be found along the trail. This trail has numerous access points, but we will only address two here; Burnett Gap parking lot and Cedar Creek Cave Road trailhead parking lot in Greene County. Turn left 1.7 miles to the Meadow Creek Fire TowerRoad, turn left and ride back to the trailers. Ride straight across to Tweed Springs Road and turn right to go the old Yellow Springs Hotel and loop after the hotel and right turn rides the ridge 14.8 miles to Cedar Creek Cave Road trailhead. Starting at the Burnett Gap parking lot, ride west across State Route 107 and ascend Meadow Creek Fire Tower Road passing the Meadow Creek Fire Tower on the left. After the tower turn left through a forestry gate and follow a fire access road approximately one mile before one can find the Meadow Creek Mountain Trail on the right marked by an old wooden forestry sign and yellow paint on the trees. Continue to follow the trail along the crest of the mountain back down onto a saddle. Really look for the trail here because it is hard to find (look real hard for the yellow on trees to the right) and the trail loops back along the right around the mountain through the woods and back up onto the ridge of the mountain. Ride down off this ridge into a grassy crossroad. (this part is being rerouted!). One can then ride two ways. Ride right to follow the service road to connect with the Meadow Creek Mountain Road and turn right to make a loop back to the beginning, OR ride straight through. The trial then makes an ascent of Clifty Mountain before leading down to the trailhead and turn right on Long Creek Road (County Road 2576) in Cocke County two miles to Meadow Creek Mountain Road turn right and follow back up about two hours to Burnett Gap. Starting at the Cedar Creek Cave Road trailhead parking lot in Greene County, this trail climbs to the ridge-line of Chuckey Mountain, following the ridge-line it crosses the Gum Springs Trail and then follows the ridge-line of Meadow Creek Mountain to Forest Service Road #142 (Meadow Creek Mountain Road). Directions: From Greeneville take Hwy 107 south through Houston Valley. Cross the county line and just before Houston Valley Campground, turn left towards Weaver Bend on a gravel road where there is a pond and log house. Take the first left and park at the end of the road in a wide gravel area. Description: This section of Paint Mountain Trail is marked with yellow blazes and has recently been redesignated to allow horses after previously being open for hiking only. You passed the trail on your left (at the information sign) as you approached the parking area. It climbs Paint Mountain and intersects with Chimney Rocks trail in about 2 miles. You can turn right and follow the Chimney Rocks trail (yellow blazes) to Weaver Bend and return to the parking area along the road. This loop is about 6 miles. You can also continue on the Paint Mountain Trail (blazed yellow) and make a larger loop using forest road 54B. Gravel roads also lead to Paint Creek or to Hwy 107 at Pine Springs Church. Directions: Drive south from Greeneville, Tennessee, on Highway 70, locally known as the Asheville Highway. Set trip counter at the last traffic light with Food City on the left and McDonalds on the right. Drive over the Nolichucky River and dam at 8.5 miles and turn west on State Route 107 which winds through Houston Valley. Cross the Greene/Cocke County line and turn east onto State Route 70/25, drive 3 miles and turn south at the “Wolfe Creek” sign onto Wolf Creek Road, turn right at Wolf Creek Church, then turn right on gravel road. It is well signed. Follow the signs to parking lot where trail head begins. Description: The old wagon road (an old county road cars used in the past to drive to the hamlet of “Wasp”) to Wolfe Creek Water Fall was re-designated as a horse trail, widened and cleaned out. It provides access to an historical area and an extensive gravel road network which connects to the adjacent Pisgah National Forest. Wolfe Creek parking area was finished and direction signs to the trail head were installed in the summer of 2010 on State Route 25/70. Trail History: Wolf creek trail has been signed. A little work needs to be done at the bottom before the falls. There is a grant for hitching posts to be put in at the parking lot. Also, the trail will get rerouted where there are some “speed bumps” that trap water. Directions:From Greeneville, take State Route 107 heading North for 6 miles. Follow signs to Horse Creek Recreation Area until you reach Greystone Road on your right. Follow Greystone Road to Shelton Mission Road on your left. Take Shelton Misson Road for 2.2 miles to the trailhead. Description: 2.68 miles of trail (yellow blazes) with an elevation change of almost 2,000 feet link the trailhead on Shelton Misson Road to Low Gap on Little Bald Mountain. A primitive campsite is located at the junction of Bullen Hollow trail and Margarette Falls trail (the latter trail is for hiker use only).